Complete with a protective mesh, screws and chain made of stainless steel（SUS304）.Stays clean and rust resistant at all times, this product is designed to maintain cleanliness and sanitation where it is installed. 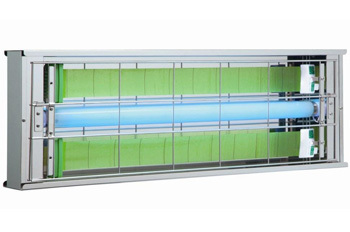 The product lures insects and pests with UV ray at the wavelength of 365nm (which pests and insects love) and keeps them trapped with powerful trapping paper (Mushipon).Utilizing no pesticide, the product is free of toxic, zapping noises, odor, and smoke.This insect catcher keeps out insects and pests that are potential carriers of harmful bacteria such as E.coli (O-157). By keeping the insect bodies complete, users can also determine the source of outbreak and paths of insect intrusion based on the type of insects trapped. This will prove to be helpful for premises that seek to achieve HACCP compliance. 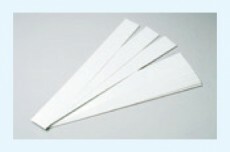 With polybutene (PB) as the main material of Mushipon, the product does not dry up easily and offers exceptional adhesion, thereby delivering ultra-long product life. Standard version of the 2000 series. Featuring a cover for Mushipon on one side to conceal the paper and keep the place clean and orderly. Featuring a single-sided shade for the lamp to contain UV light and keep away insects. Double-sided cover for Mushipon conceals the insect-covered paper and keeps the place clean and orderly. 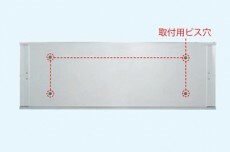 The DXA model is an enhanced model of the product with double-sided Mushipon and cover to conceal the insect-covered paper and keep the place clean and orderly. Basic model of the wall mounted K Series. Occupies minimal space; best suited for environments of limited space. 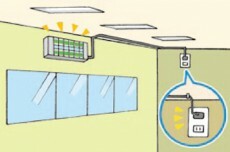 ※Wall mount installation only ※Cannot be modified to hanging type. Complete with cover for Mushipon to keep the place clean and orderly. Simple mesh installation process to improve installation efficiency by approximately 40%. 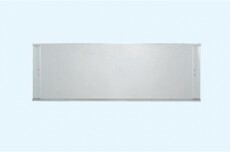 Products can be built to specific voltages used overseas according to customers’ request. 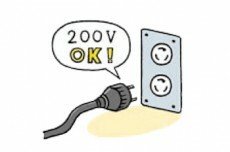 Customers are reminded to confirm the type of plug used in the intended region/country and relevant electrical safety specifications. For working environments that are humid or susceptible to moisture, users are recommended to choose our Water/Moisture Proof Insect Catcher. IP Series. 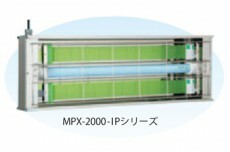 The cover can be installed over the protective mesh to modify your Insect Catcher as a DXA model. 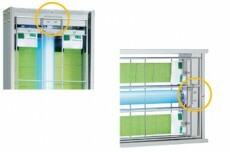 Cover available as an option for users to modify their Insect Catcher into wall mount type (K/T Series). 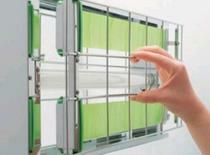 Allows users to install their Insect Catcher firmly onto any wall without having to use a chain. Users can use the mesh grid design tool (sold separately) to modify their Insect Catchers into wall mount/stand type models. 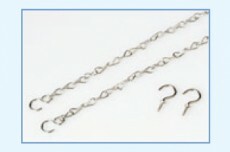 Users can use the chain (sold separately) to modify their Insect Catchers into hanging type models. ※Models in the T-Series are designed specifically for wall mount installations and will not work with the chain for modification. 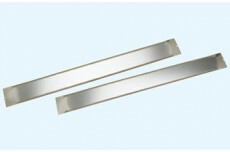 Designed for placement of Mushipon; can be easily cleaned to maintain cleanliness. 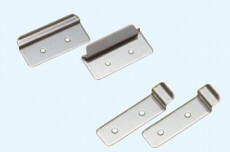 Users can purchase accessories to freely modify products to wall mount/stand type. 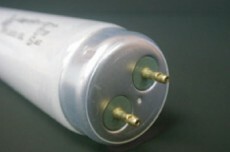 Shatter-resistant lamps are designed to prevent injuries from broken glass shards (or unintended mixture into food/product) should the lamp be accidentally dropped during replacement. ※Available as option; please notify us when placing your order. Power cable length can be tailored for specific venues of installation.